A Poole based Window Cleaning company delivering high quality exterior cleaning services to the Poole conurbation and outlying districts. Welcome to the website of Pristine Pole. 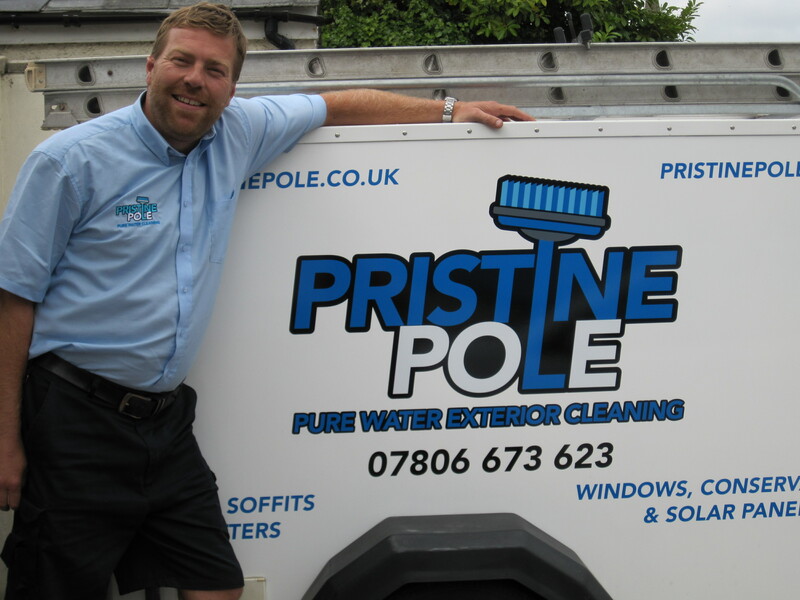 Based out of Poole, Dorset, I provide premium quality exterior & window cleaning solutions as well as any general maintenance requirements. Using the latest Pure water window cleaning technology delivered to high reach water fed poles I'm able to clean the areas that traditional window cleaners cannot. Please take a few minutes to browse the services offered and contact me for a free no obligation quote. All windows are cleaned to a "Pristine" standard - Frames and Sills are cleaned Free of Charge. I'll be there when I say I will- using the latest online calendars mean that there will be no unadvised missed appointments- ever. All of my work is 100% guaranteed and insured with full public liability insurance. Free Text before I come service - I'll text you the night before so be clear on when i'm coming. Is it worth having my windows cleaned when its raining ? People sometime ask what I do when its raining ...simple answer is that I pop on my waterproofs and carry on! Using Pristine Poles Pure Water system in the rain is no different from in the dry. There is a simple fact: Rain doesn't make windows dirty, dirt does. I cover a wide area up to 15 miles from Poole, including Westbourne, Wallisdown, Branksome, Parkstone, Lilliput, Sandbanks, Lower Parkstone, Hamworthy, Upton, Lytchett, Creekmoor, Canford Heath, Broadstone, Corfe Mullen, Wareham, Swanage and outlying Dorset Villages.